The spiral slicer I use for salads makes the dishes very attractive. Not only that, it makes even a fussy eater to have salads without any issue. I got this slicer around 3 years back from a small shop here in Singapore and I do not remember the cost. It is very faster than regular cutting with knife. 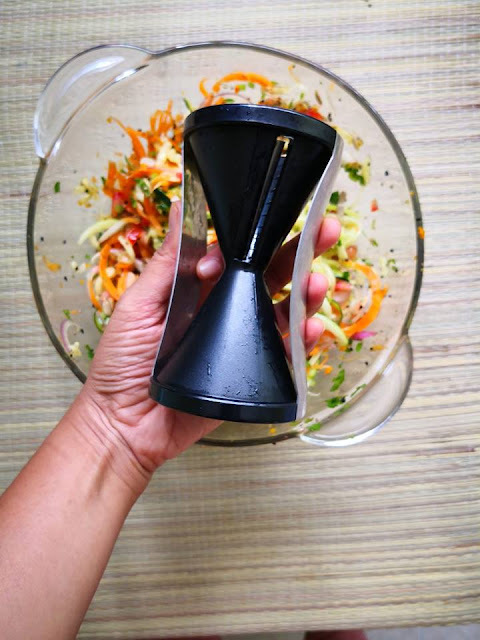 Scroll down for my suggestions & tips to buy a spiral slicer. 1. Make sure it is handy. There are many slicers which are quite big. 2. Make sure it can be cleaned easily. 3. The size of the vegetable after cuttting it must be thin. This can be seen clearly in some of the pictures. If you find a shop (not online) check if a demo is possible. Since many of my instagram followers asked me for suggestions I took few from Amazon India. These are just my suggestion as they look similar to mine,I have not practically tried.